At face value, none of that looks particularly good now, it is important to note that the group continues to make progress in all their markets. 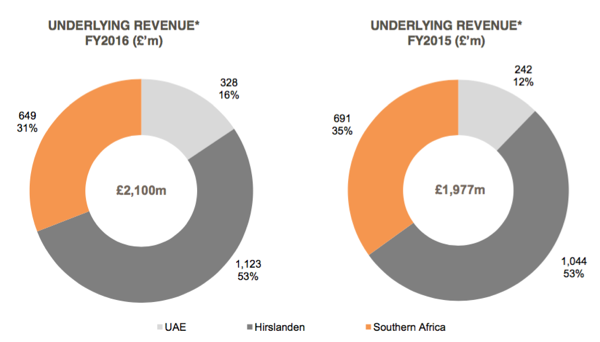 Switzerland was pleasing, South Africa was decent, the UAE is going to benefit from cost savings across a larger beast, effectively doubled after the Al Noor reverse takeover. The reason why something is called a reverse takeover is normally when a much larger business uses a more favourable platform (in this case a London listing) in order to achieve a "take over", when in theory, Al Noor integrated Mediclinic. That is now water under the bridge, as the company embarks on delivering a quality service. In the outlook segment Mediclinic says Notwithstanding the on-going changes in the global and regional economies and the regulatory changes that continue to impact healthcare and its affordability, we are continuing to see a strong demand for quality private healthcare services across our three operating platforms. You can have monster revenues, what matters most to investors at the end of the day is whether or not those businesses are profitable or not. 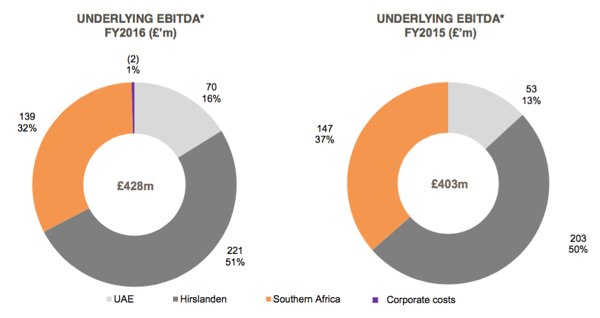 So then, let us look at the breakdown of the underlying EBITDA (Earnings before interest, taxation, depreciation and amortisation). The reason why investors and accountants like to look at EBITDA is that it eliminates both accounting and financing effects, and can make like-for-like comparisons a little easier. Of course the other major comparison is to take free cash flow generated and measure that against another company, I guess one should always take a holistic view of a company and factor in everything, before coming to any conclusion on whether the business is likely to be a good investment (at this point) or not. Again, we are going to stress that these numbers will evolve rapidly and that you won't necessarily be able to gain much from the comparable reporting period until this time next year. At that time, currencies would have "settled", the transaction in the UAE would have been errr .... bedded down. We like the sector, we like the company, we like the fact that they have a big shareholder in Remgro that can be alongside you as an investor in order to embark on more transactions, if needs be. We continue to accumulate the stock, we really think that the future is very bright, the company will execute properly and professionally. Finally, let us deal with your price paid. I have fielded many calls lately about people who are either questioning the price paid, or worried that they have lost money on the investment. Trying to keep it simple, you were bought out of your old Mediclinic shares at above 127 Rand, in return you were awarded new Mediclinic shares in the ratio of 0.625 of the old ones at the prevailing Pound price of Al Noor. At the time of the award the Rand was on a far weaker showing against the Pound Sterling, hence your price purchased for the new Mediclinic shares (listed in London) is higher. The easiest thing to do, to determine whether or not you are in the money is to go back and look at all the transactions on your statement, the Rand amount, including the Mediclinic rights issue, and see what the total is (we have clients who have bought them in multiple transactions). And then compare it to the Rand value of the Mediclinic shares you own now. Easy enough, not so?